As some of you might have heard, the times they are a-changin', as are boons. So let me break it down for you. 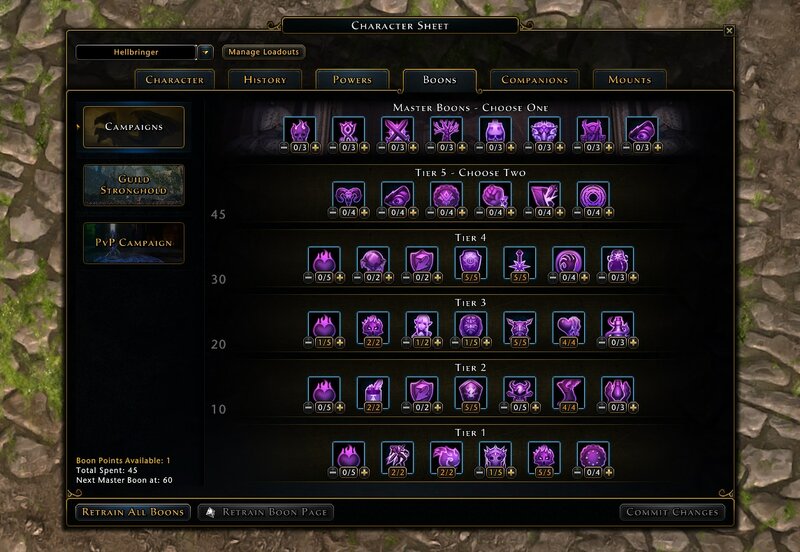 Boons are a big part of the Neverwinter fabric, and as the game gets older we want to ensure that this feature will continue to provide worthwhile options for players as they take on the challenges that come with each new module. So how did we go about doing this? Well first we had to identify what exactly needed to be changed/updated with the system. One of the first things was simply how players interact with boons. Currently looking at your boon choices and trying to compare them is not a simple feat and retraining all of your boon points means clicking through multiple UI windows. This makes what should be a straightforward and simple experience feel cumbersome. To address this issue we decided it was time to unite all of these pages into one page to rule them all. And so without further ado I would like to welcome you to the new age of boons. I know it is just a simple UI change but, when considering just the current number of options, this small change makes a major difference. Along with this UI unification, we also unified boon points. Gone is the notion of a specific type of boon point for a specific boon group. Now you can engage in campaigns broadly without feeling like the time you spent on one staggered your progress towards another. While it still behooves you to engage in all of them to get more boon points, this change gives you more freedom in how you go about collecting all of these boon points. Now that we have that covered, allow me to walk you through the UI while I explain some of the other systemic changes. This header indicates the tier of the boons within that group. Boons have 5 tiers. Each tier requires a minimum amount of points be invested before they can be used. With each new tier more options become available allowing you to invest points into the boons that you feel most benefit your playstyle or build. This tier you can invest points in two selections up to their max. So, using the main screen above for reference, you can invest a maximum of 8 points in tier 5 and it can only be spread across 2 of the boons that are available, each having 4 ranks. The number to the left of each tier indicates the amount of points needed to unlock that tier. Above tier 5 is a section labelled Master Boons. These represent boons that do a bit more than just give passive bonuses. These boons are similar to the boons you would find on the right or at the top of our current boon windows. Master boons are limited to one. Which means that you can invest points in one at a time. Each rank increases the strength of the boon and may add some additional functionality. So how do you unlock master boons? Like the rest of the tree by simply spending points. But unlike the other tiers master boons do not cost a boon point. They are a bonus choice you get for investing in the rest of the tree. That pretty much sums up the new boons system. For those of you wondering what will happen to your current boon points they will be converted to the new universal boon point. So when this goes live you will have a pile of tasty boon points to spend along with a bunch of other great things coming with M16. As far as low level boon details our overall goal with boons is to provide the player with a way to customize their character beyond just levelling up and choosing different power setups. This paradigm exists in the form of various other systems like companions, artifact equipment, and enchantments. While change can be scary, over time some of these systems have to be reevaluated to see if they are still serving their primary purpose without being a detriment to overall game health and balance. This is very much the theme of M16 as we look to the longevity of this wonderful product. I am happy to say that, in their new form, boons still offer the player a variety of choices that benefit varied playstyles while managing to meet our overall game balance goals for M16. Until then, I bid you adieu and I look forward to adventuring with you again sometime soon.